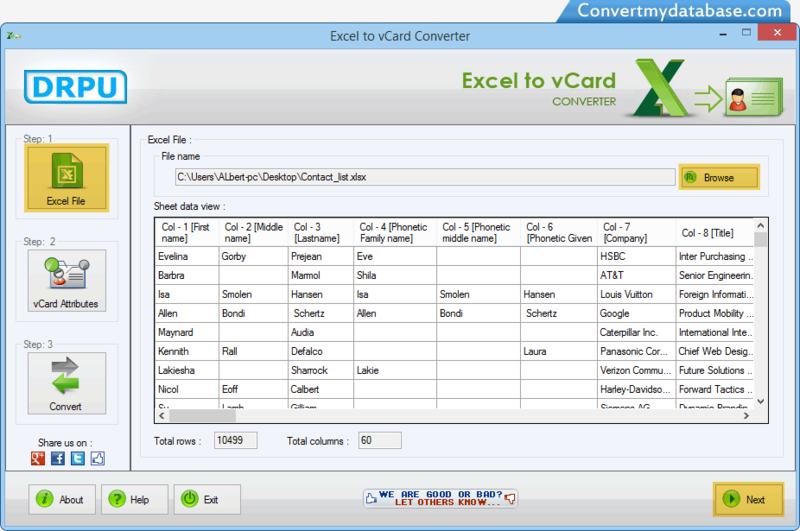 Excel to vCard converter software empowers you to convert excel contact list into VCF file. Excel to vCard program can convert all excel contact list into vCard for various social networking websites like Google+, Facebook, Twitter, Linkedin etc. Excel to vCard converter software converts entire MS excel data into .VCF file format. Now you can easily convert contacts (stored in MS excel file) into vCard file formats. Browse Excel file of contact list from which you want to convert contacts into vCard and go to Next. Excel to vCard migration software allows you to convert MS excel contacts list into vCard file format. Excel to vCard converter tool is compatible to work with all latest versions of Microsoft Excel. Excel to vCard program convert excel file contacts list into .VCF files and these converted files can also be imported in the address book of your email accounts such as Gmail, Yahoo etc. Software converts all excel file contacts into .VCF file format without installing MS Outlook on your PC.